today's outfit is one of my go-to spring casual looks. the light chambray shirt is comfortable and chic and the colored denim is cropped at the ankles for a warmer vibe. completing the look are my leopard print clogs. the clog shoe is typically a style worn during winter, however the open toe brings you into spring quite perfectly. i accessorized with the newest addition to my watch family, the ESQ ONE™. it's cool, it's colorful and it has the swiss quartz precision of the ESQ Movado brand. 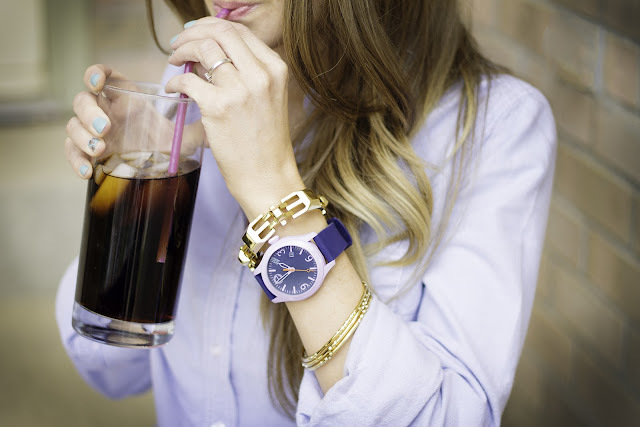 there are twelve color combinations and the purple works like a charm in my wardrobe. i added some extra gold bangles and a geometric shaped bracelet to keep it casual without losing that fashionable edge. no blogging sesh would be complete without my pink Mac and Cherry Coke. I am always so jealous of the way you accessorize. I need to learn from you!! Arielle, you are the sweetest. Thank you! Your hair looks absolutely fantastic in this post. AND always.